The station is powered by a WM-918 made by Oregon Scientific weather station. The data is collected every 10 seconds and the site is updated every 5 minutes. This site and its data is collected using Virtual Weather Station (VWS) software. The station is comprised of an anemometer, a rain gauge and a thermo-hydro sensor situated in optimal positions for highest accuracy possible. Weather station used to create the weather data is the WM-918 made by Oregon Scientific. It was purchased and installed in October of 2001 and has never gave me any problems. This station is no longer produced and when this current station dies I plan to purchase a Davis Vantage Pro as a replacement. A great source for buying a station is Ambient Weather . They seem to have the best prices and have great support. 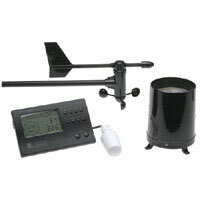 Weather station software used on this site is internet version of Virtual Weather Station (VWS) made by Ambient. Over the years I have had a few problems with this software but as of the past few years the author worked out the bugs and has been trouble free. Since this station is at my cabin and is unattended allot, it was important to me to find stable software and this fits the bill. ImageSalsa is the software used for the web cams. Here is another software package along with Moviesalsa that seems to be indestructible and trouble free. Here is a great forum for both VWS and ImageSalsa. Within this forum you will find just about any answers to questions related to these software packages and more. Here is one of the capture cards that I have started to use the past couple of years and have been very happy with the performance of it so far. It provides 4 ports that can be accessed independently and works well with ImageSalsa. 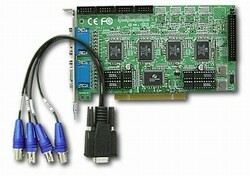 The PV-149 4 port video card is used in 3 of my computers up there and have worked great. I also have other cards that I use but for the price, this card gives you the flexibility to add more cameras on one computer and is cheaper in the long run. Here is one of the cameras used for several of our cam images. This is the Pro 420 and is one of the clearest I/R cameras that I have found for the price. This camera is used for the North Cam, Snow Cam, Middle Cam, Critter Cam, Garage Cam and Garage Cam 2. They produce a very clear colorful image during the day and clear black and white image at night. This has been the camera of choice as of late. This is the camera I started out with. The Kodak DVC-325 USB camera is in my opinion one of the clearest USB cameras that were ever produced. They are no longer manufactured but can still be bought off of Ebay. I have 4 of these cameras in use. The East and West Cams are Kodaks along with the South Cam (which is the first one I started out with in 2001) and the Three Doors Down Cam. This camera along with ImageSalsa is a cheap way to get going for a web cam. This is the camera I use for the Tower Cam. It is a Panasonic WV-CS850 PTZ camera that is installed in a POD-7CW dome housing mounted about 30 feet on my tower. I still need to complete this install to give me complete control over the PTZ and ultimately make it available via the internet. This is the camera I use for the North West Cam. It is a Panasonic WV-CP460 camera that is installed inside looking out my front window. It's an expensive camera but gives a good clear professional image. This camera I use for the Cabin Cam. 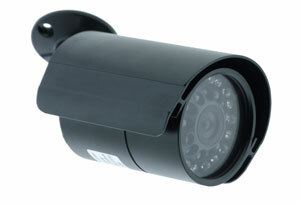 It is a Long Range Color Day/Night Weatherproof IR Camera Model SX-420. This was kind of an experimental camera that turned out ok. It has good IR range but doesn't have the clarity that the Pro 420's have. Now for the computers and how they are tied together. I have 10 computers at various locations that collect the images from the cameras that are ultimately transferred to my main computer. My main computer collects the data from the weather station and also collects the images from the other computers and makes the transfer to the web page. Each computer is running Windows XP Pro and has a UPS attached in case of a power failure. The transfer between the computers is done wirelessly via 3 Linksys routers with a repeater between them. The routers were upgraded to DD-WRT firmware to make them into access points so all the computers could communicate over a large area. This has worked out real well and gives me the ability to connect to each computer at my cabin to do maintenance without having to go to each computer. Since about half of the computers used don't have monitors and keyboards connected to them being able to connect to them remotely has it's advantages. I use Real VNC to remotely control the computers from my main computer. Recently, DSL has become available to our area so now have a broadband connection with the old dialup as a backup.